*The estimated statewide cost of habitat-related elements in regional salmon recovery plans for 2010-2019 is $4.7 billion in capital costs. This amount does not reflect non-capital costs. Percent funding available is 16.34 percent of the funding needed. www.rco.wa.gov/documents/gsro/SalmonRecoveryFundingReport2011.pdf. The actual funding represents funded and proposed projects for state and Pacific Coastal Salmon Recovery Fund funding, administered by the Recreation and Conservation Office, from 2010-2019 with a total of $770 million, including the funding request for 2019. Represented programs include the Chehalis Basin Strategy, Estuary and Salmon Restoration Program, Brian Abbott Fish Barrier Removal Board, Family Forest Fish Passage Program, Flood Plains by Design, Puget Sound Acquisition and Restoration, Salmon state projects, Washington Coast Restoration Initiative, and Yakima Basin Integrated Plan. The results are only for projects, not activities. Activities include regional and lead entity support, hatcheries, monitoring, research, outreach, and enhancement. For salmon recovery to be successful, the recovery plans must be fully funded. We know how to recover salmon and restore their habitat, and tracking efforts have proven the work is successful. While there have been significant investments in recovery, government funding has not been enough to fully implement the salmon recovery plans. Without enough funding, the projects and changes needed to recover salmon from the brink of extinction cannot be implemented. Without these projects and changes, salmon will go extinct. To deliver salmon recovery on the ground, additional funding is needed for the regional and local watershed organizations responsible for implementing the salmon recovery plans. Regional organizations have never been funded fully to lead implementation of recovery plans. A 2011 study of the cost of implementing the regional recovery plans’ habitat projects alone showed a need far greater than state and federal money provided. 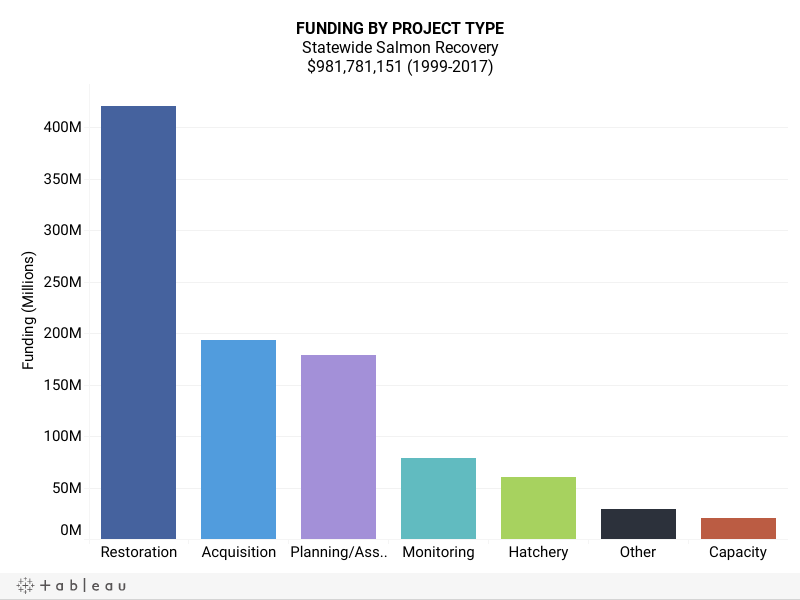 That study showed the statewide cost of habitat-related elements in regional salmon recovery plans for 2010-2019 is $4.7 billion in capital costs. Recovery organizations received only a fraction of that amount, about 16 percent. Is it any wonder that salmon remain on the brink of extinction? Many of the smaller habitat projects have been completed. Funding is needed now for larger projects that affect larger, more complex landscapes and cross jurisdictional boundaries. These high priority habitat restoration and protection projects need to be funded to achieve salmon recovery. For example, Chinook salmon and steelhead must travel 7 miles, partially in a concrete channel, through Walla Walla, sometimes getting trapped inside and dying because the water is too hot. A local partnership called the Mill Creek Working Group is working on a watershed solution that will open 50 miles of spawning and rearing habitat in the short term. This large and complex project is estimated to cost $25 million and require the involvement of the Confederated Tribes of the Umatilla Reservation, Washington Department of Fish and Wildlife, Walla Walla County, the City of Walla Walla, U.S. Army Corp of Engineers, Walla Walla County Conservation District, National Marine Fisheries Service, U.S. Fish and Wildlife Service, Tri-State Steelheaders Regional Fisheries Enhancement Group, the Snake River Salmon Recovery Board, and other local groups. On the west side of the Cascade Mountains, King County is planning a $15 million project to reconnect 52 acres of floodplain to the Cedar River by removing nearly a half-mile long levee and its fill, building a side-channel, and planting the area to create more diverse types of habitat for salmon, steelhead, and trout. The Cedar River in this area doesn’t have enough places with slow-moving water for fish to grow and hide from predators. Complex projects like these are the ones that will make the biggest difference but also require the most effort and funding. We need stronger protections, better compliance, and more enforcement of land use regulations to protect shorelines and improve fish passage and water quality. Increased enforcement and greater precautions should be activated for construction in or near salmon waters and for habitat and water quality violations. Revisions should be made to eliminate exemptions for building docks, shoreline armoring, bulkheads, and rock walls along shorelines. Development cannot continue the way it has if we are to recover salmon. With anticipated population growth, low-impact development requirements, native landscaping, and green infrastructure need to become the norm. Any new development must use softer techniques while watershed functions are restored by retrofitting previous development impacts. Much of Washington’s development was done before modern stormwater requirements and now impact both stream function and water quality. Solving stormwater problems after they are created is tremendously expensive—estimates for restoring small urban streams can reach over a billion dollars. Stormwater from new development is much better managed, but is nowhere near sufficient to protect salmon. Even though Washington is a national leader in stormwater management, to sustain salmon we will need to invest heavily in remediating the impact of development. We need to make more careful choices about where and how we accommodate growth and where we choose to protect salmon habitat. We must act to keep our rivers and streams filled with cool, clean, oxygen-rich water. We can do this by planting trees and protecting mature forests, enhancing streamside forests, and establishing corridors along streambanks that will shade and stabilize streams and streambanks. We must act to protect and improve existing, productive habitat in our freshwater, river mouth, estuarine, and nearshore environments. We must create, enhance, and protect cold spots in streams. We can do this by installing large woody structures in streams to catch and trap sediment and, make deep, complex pools and side channels filled with cool, clean water. We must protect cold water springs and groundwater sources, which can help maintain cooler summer pool temperatures. We must increase the amount of water in streams during the late summer by upgrading irrigation systems. We also must capture more water throughout the watershed through beaver reintroduction, wood loading in small streams, forest management for snowpack retention, and floodplain reconnection. We must protect wetlands, springs, and large groundwater seeps from development and water removal, as these subterranean water sources will become increasingly important when surface flows are altered by climate change. We must protect salmon against raging floods by reconnecting and increasing floodplains, wetlands, side channels, and tributary habitat to provide more places with slow-moving water so salmon can take refuge. We must fund programs and projects to correct fish passage barriers so salmon can reach existing habitat upstream and water, sediment, and wood can move freely downstream, creating better habitat for fish. We must act to implement adaptive management programs in our watersheds based on measuring and monitoring the results of our actions. Removing barriers to fish passage is one of the most effective ways to increase salmon numbers. The Brian Abbott Fish Barrier Removal Board coordinates the removal of failing culverts, bridges, and other impediments blocking salmon access to prime spawning and rearing habitat. Carrying out the board’s statewide program will open miles of habitat and enhance previous investments. We must also continue efforts to remove and decommission problematic forest road systems. Look for ways to educate and tell the important story of salmon recovery to empower and encourage current and future generations to act. 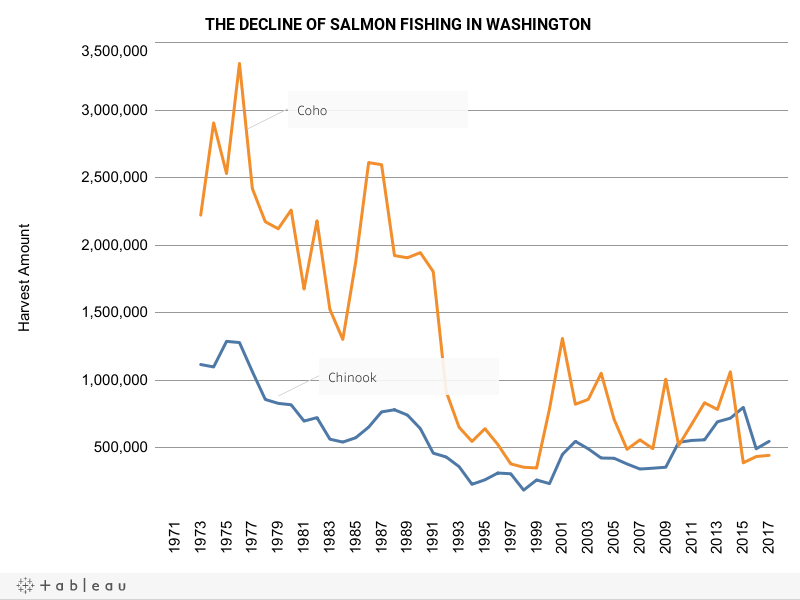 If we are to change behaviors, we must do a better job of informing Washingtonians about the importance of salmon, the ways in which we can each make a difference, and how we need to do things differently. Recovering salmon will take all of us doing more to help and changing what we do to better align with what salmon need to survive and to thrive. We must increase management activities to control animals that eat salmon, such as sea lions, as well as non-native, invasive animals that compete with and prey on salmon, such as northern snakehead. Efforts also must be made to control non-native plants, such as knotweed, Eurasian watermilfoil, and flowering rush that outcompete native plants and degrade salmon habitat. We should prioritize preventing the introduction of novel invasive species and controlling those that are already in the state. For example, northern pike, are established in the upper Columbia River and its tributaries. If management actions aren’t bolstered, northern pike could spread downstream where they could harm salmon both by eating salmon and depleting fish that salmon eat. We must address threats to salmon throughout their lives. There is no single action that will recover salmon. Harvest management can help ensure that enough wild fish are returning to their natal streams. Hatchery reform can ensure that fish reaching the spawning grounds are well adapted to conditions resulting in greater spawning success. Hatchery reform also will preserve the genetic integrity and enhance survival of wild fish by preventing too many hatchery fish from overwhelming the spawning grounds. Hydropower system management can ensure that the life cycle needs of salmon are addressed. Habitat protection and restoration can help ensure that returning fish will find sufficient spawning habitat and that their offspring will have the rearing habitat they need to improve their survival in migrating to the ocean. More progress will occur when each “H” works in concert with the others and integration occurs at all scales.